BSC CSIT 7th Semester Fourth Year Exam Center Batch 2069 , Tribhuvan University. Master Of Public Administration [MPA] 4th Semester Regular Examination 2017 | Tribhuvan University. 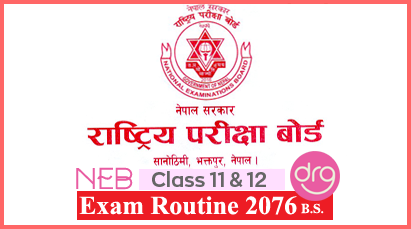 Routine Of SEE Chance Exam 2074  which will starts from 19th Shrawan, 2074 and ends on 26th Shrawan, 2074. SEE Result 2073  is going to be published on 2 Aashad 2074 [16 June 2074] within 10 am today as per Ambika Regmi. View Result Of Secondary Education Examination [SEE] 2073/2017 via Online, SMS and IVR System.